I am both excited and disappointed that Easter is next weekend. I love Easter! 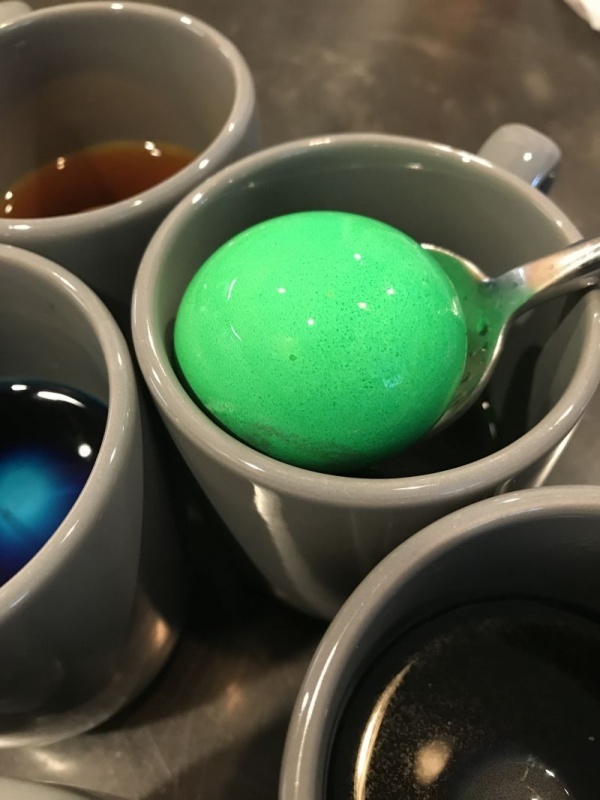 Our family always gets together and shares a wonderful meal, and the children have a grand time hunting for colored eggs. I have always enjoyed putting a basket together for them and watching their little faces light up as they “find” the colored treats that the Easter Bunny left for them. Later in the day, we would share a lesson about the Resurrection of Christ, and what the Easter Holiday actually celebrates. This always seems to herald the arrival of Spring as well, and the lovely flowers blooming in the flowerbeds add to the beauty of the day. Now, this year Easter falls on April 1st. 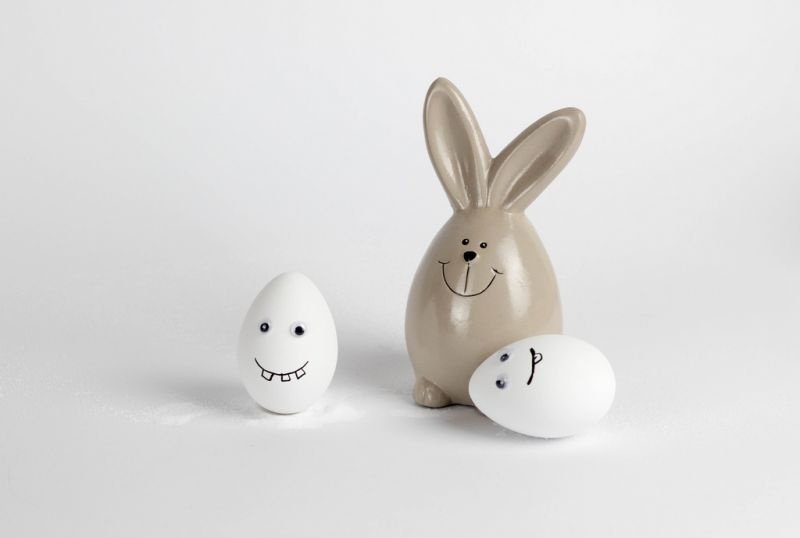 **evil grin** I had such grand plans for April Fool’s Day pranks, and they all fell apart when I realized it was Easter Sunday. I just can’t bring myself to be ornery on Easter. So, my plans will have to be put on hold for next year. Ahh, well. Amber comments: No way would I trust April handing “ME” one of these on April Fools day.. 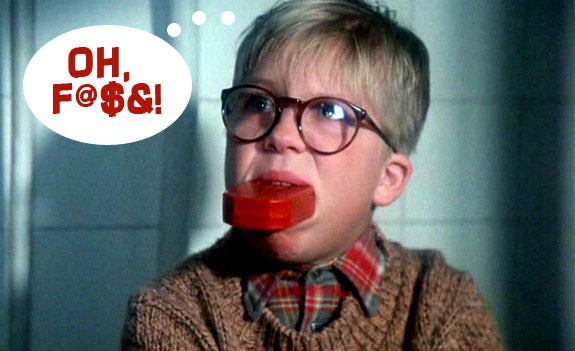 I can imagine biting into my treat and coming up with a mouthful of soap! I’ll wait until April 2nd for mine …. just sayin’! Since next weekend is the holiday, I am going to show you a fun treat to make for your family. It is very easy and does not take long at all. If you have children at home, they will enjoy making these with you. 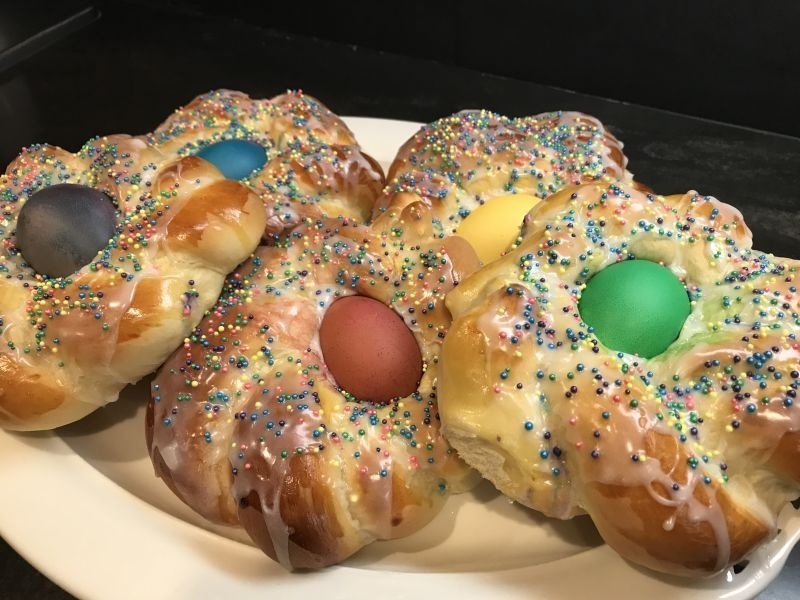 You may have seen the braided wreaths of bread with colored eggs tucked inside? 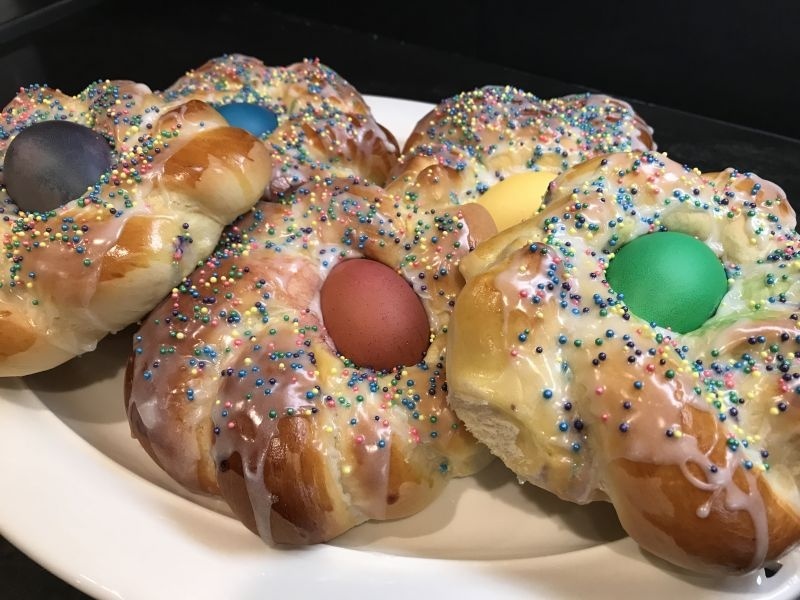 These are called Italian Easter Bread, and are so beautiful! Your recipe this week will show you how to make individual little wreaths, so everyone can have their own! If you have ever had Hawaiian rolls, you will have an idea of what this bread tastes like. It is slightly sweet and so soft and fluffy you won’t be able to keep your hands off of it. 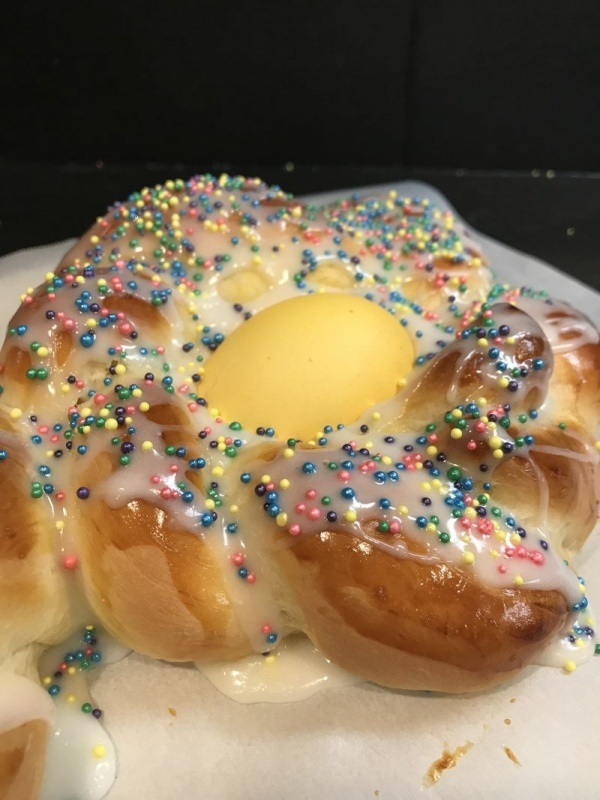 It’s absolutely perfect baked on Easter morning, because fresh out of the oven you can remove the egg and crack it open to reveal a soft/medium cooked egg. Then, tear off chunks of the warm bread and spread that soft egg on it for breakfast! Now, this is very important…if you do not eat the bread right away, YOU MUST DISCARD THE EGG. Once the egg cools to room temperature, it is no longer safe to eat. 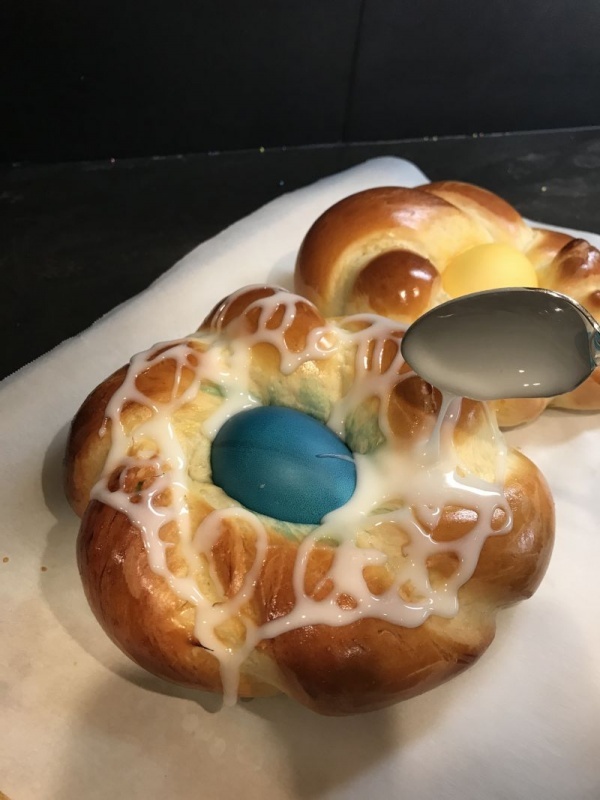 The bread is fine, but the egg will not keep. Please don’t forget this! I don’t want anyone getting sick! 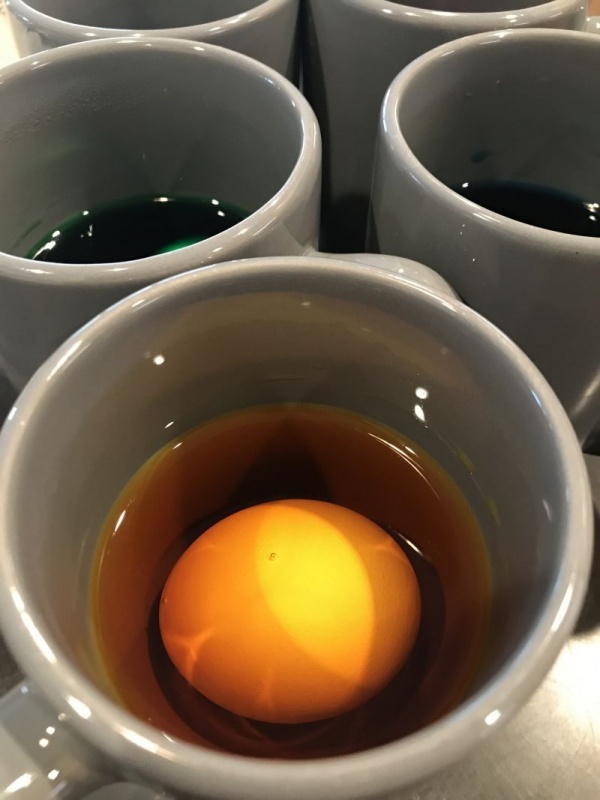 Amber comments: If you are going to give them away, when the bread is all cooled, replace the fresh egg with a plastic egg filled with goodies or a chocolate egg for a special surprise treat! I would definitely say that this is a beginner level recipe. 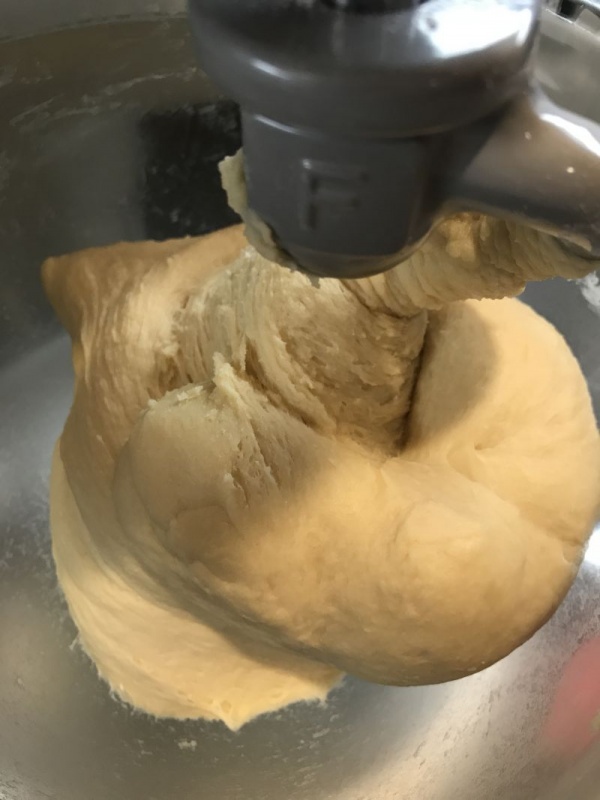 You can use a bread machine to make the dough or use a stand mixer like I did. 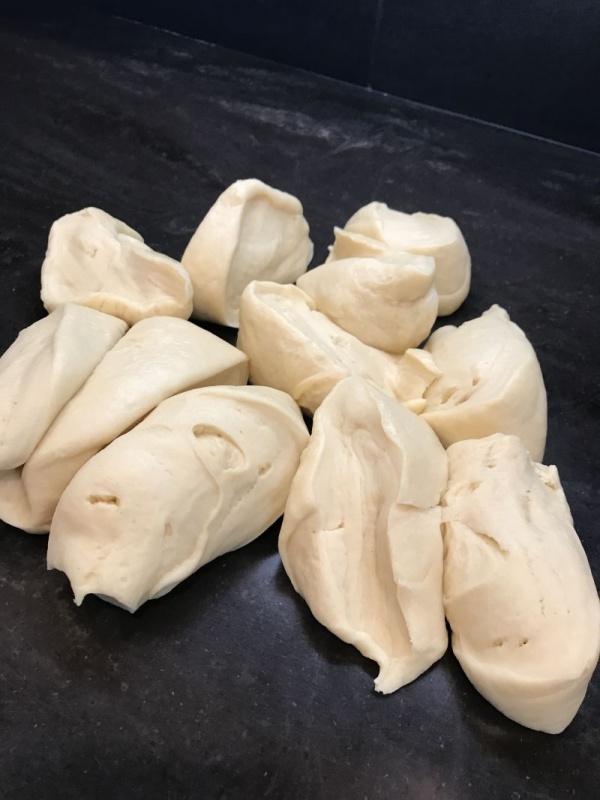 If you already know how to knead bread dough, you can do it the old-fashioned way and knead it! 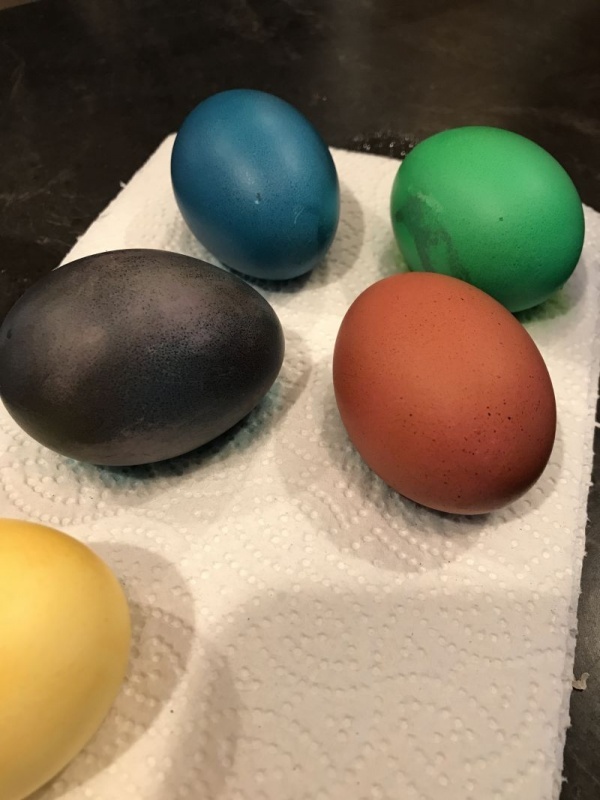 6 eggs, raw, dyed like Easter eggs. (the eggs cook in the oven with the bread) DO NOT USE HARD BOILED EGGS! 1. Warm the milk in a pan or the microwave. Warm, not hot. 2. In a large mixing bowl, stir together the yeast, milk, salt, butter, eggs and sugar. 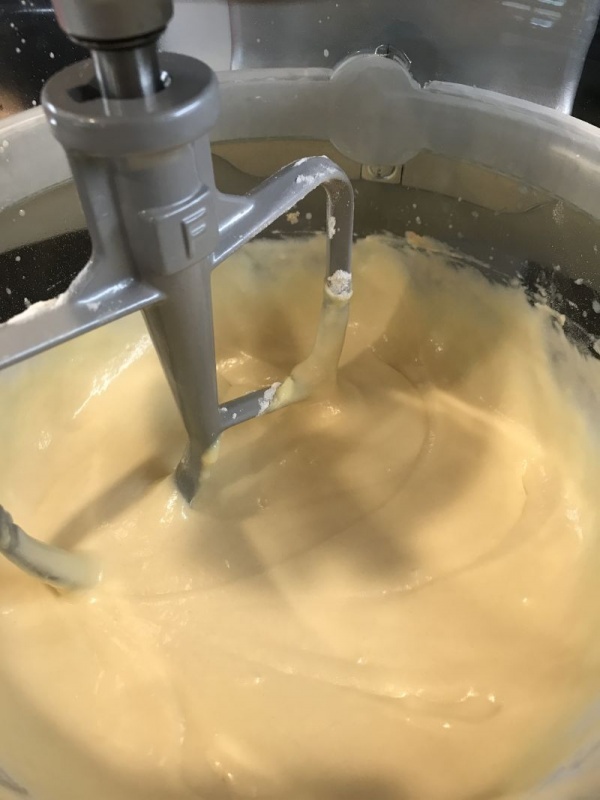 Using a mixer, beat until smooth and velvety. 3. Add 2 cups of the white flour and mix well. 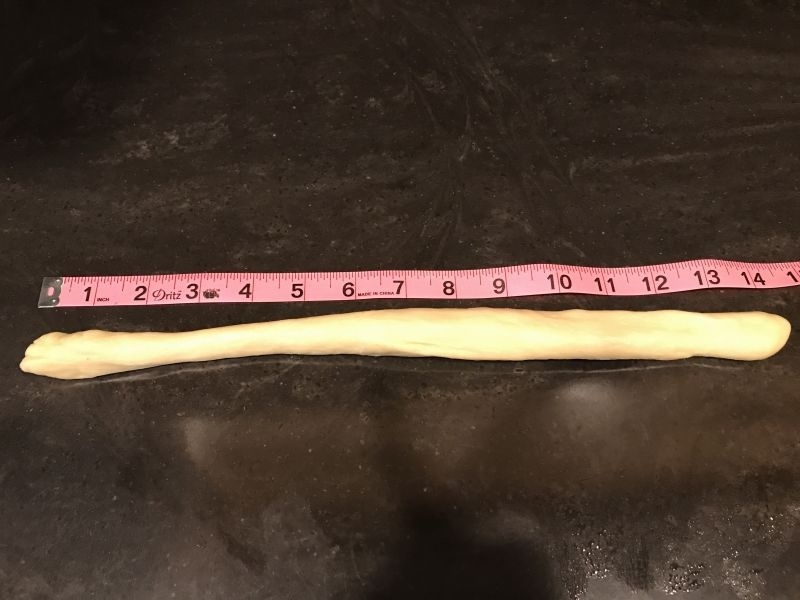 The dough will be very sticky. 4. 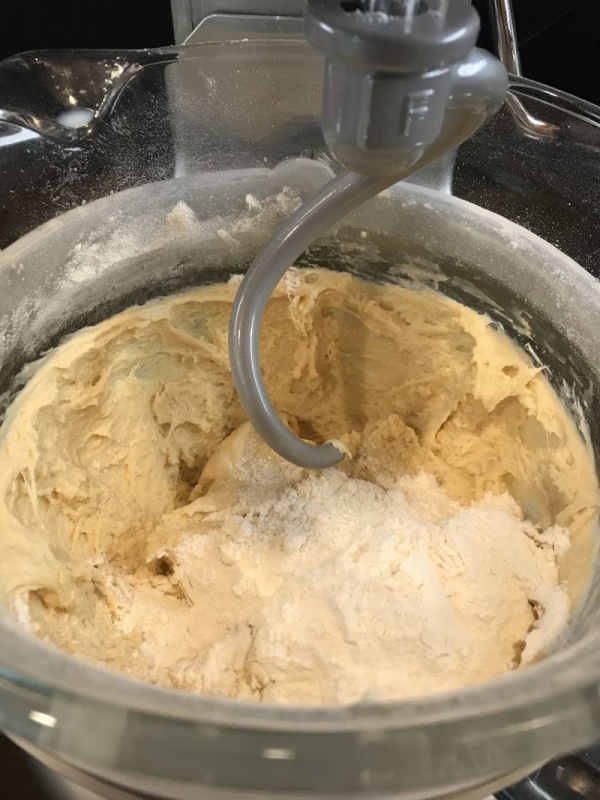 If you are using a stand mixer, change the paddle to the dough hook and continue to mix in the rest of the flour. If kneading by hand, work in the rest of the flour by hand. WHILE THE BREAD IS RISING FOR THE FIRST TIME, COLOR YOUR RAW EGGS AND SET THEM ON A PAPER TOWEL TO AIR DRY. 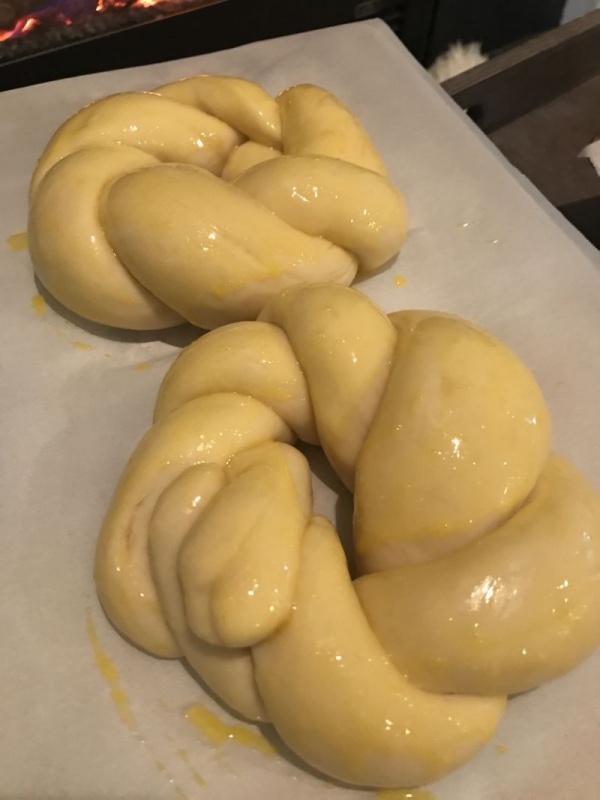 THEY NEED TO DRY AT LEAST AN HOUR BEFORE PLACING THEM IN THE DOUGH. 7. 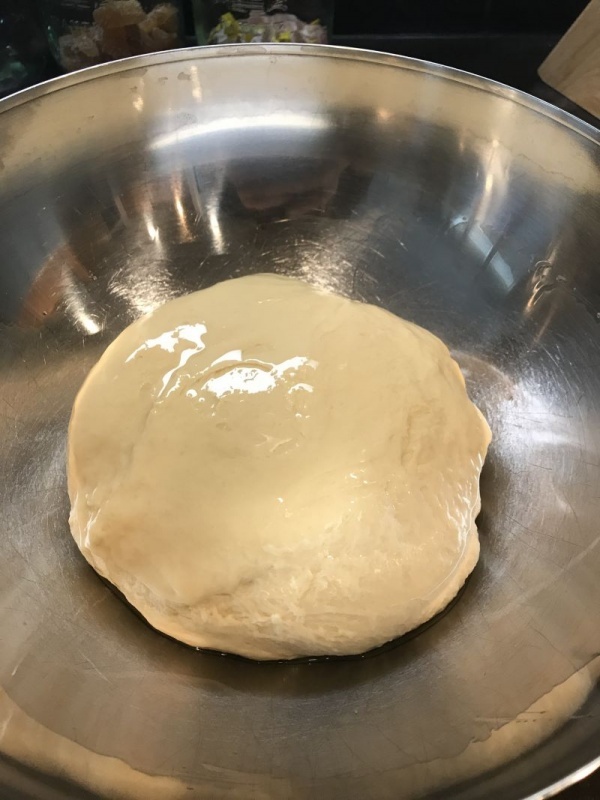 After the dough has risen for an hour and doubled in size, remove it from the bowl and knead it a bit. 5-10 kneads will be enough. 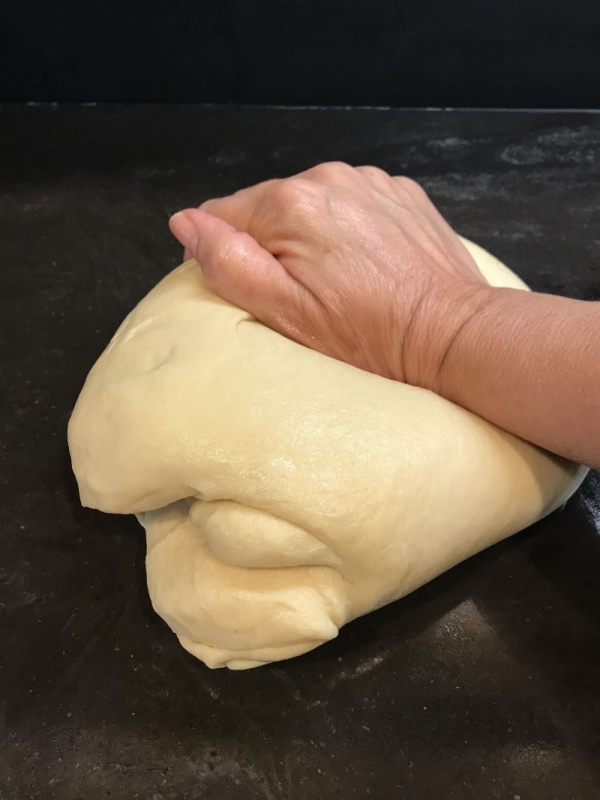 Shape the dough with your hands in to a round shape. 8. 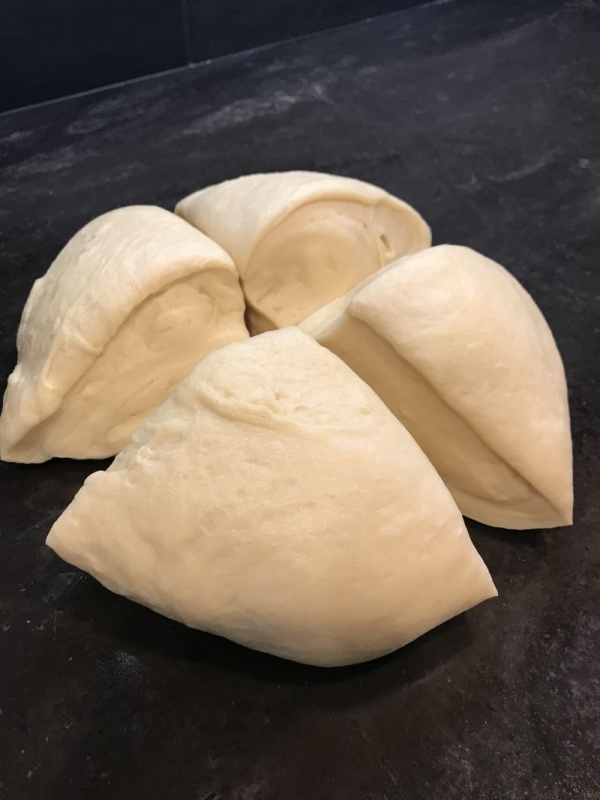 Cut the dough into quarters, and then take each quarter and cut evenly into thirds. 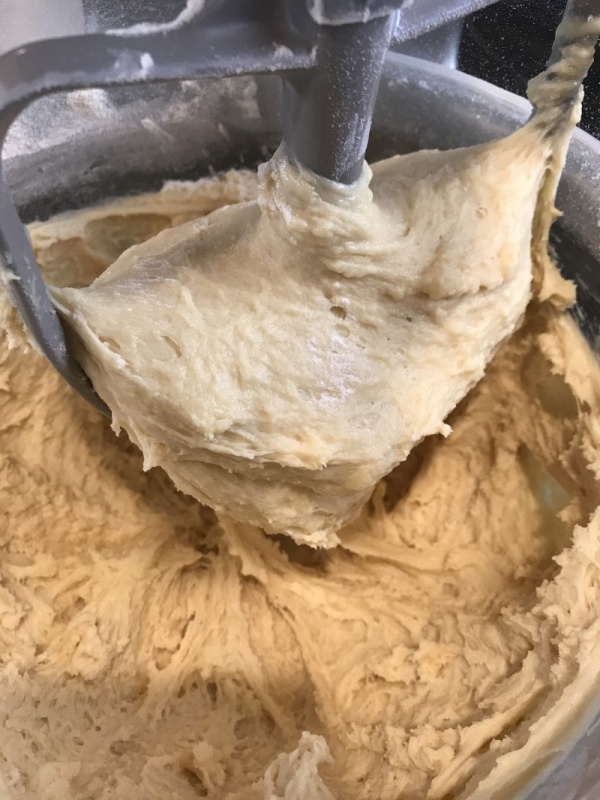 This will give you 12 pieces of dough. 9. 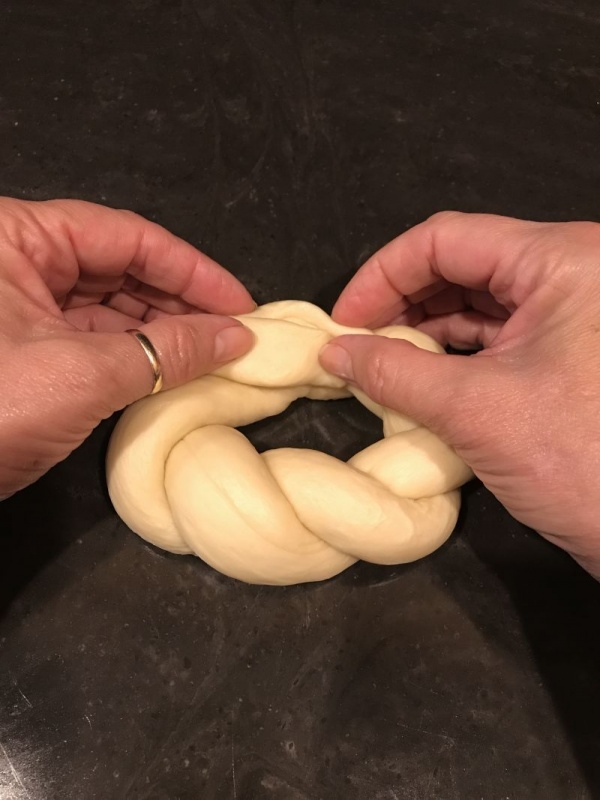 One at a time, pick up a piece of dough and knead a few times in your hands to make a “log.” Roll the dough on the counter to make a 14 inch rope. Repeat with all 12 pieces of dough. 10. 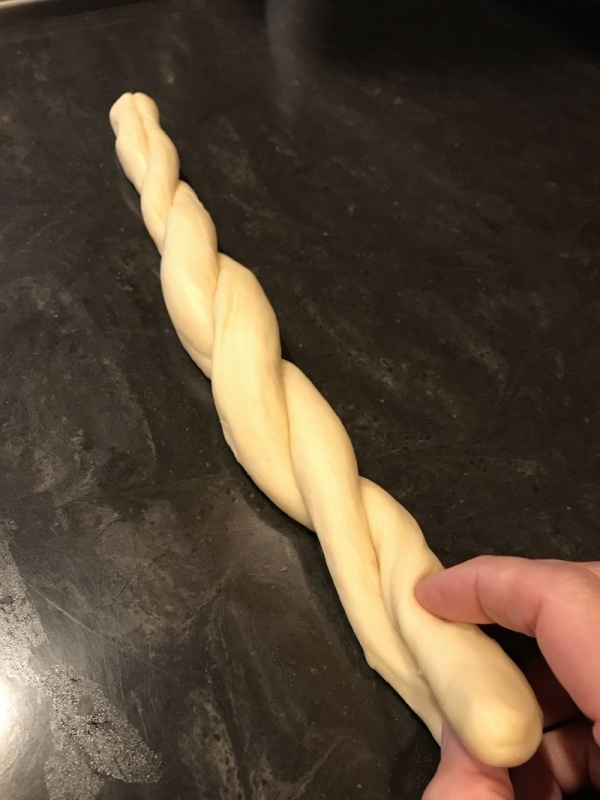 Twist two dough ropes together by lifting one rope over the other, and repeating until the entire length is twisted. Take the two ends and wrap around to meet each other, forming a wreath. Tuck the ends together to make it look like a continual braid. Place the wreath on a parchment paper lined cookie sheet. 11. Cover the wreaths with a clean dish towel and allow to rise in a warm place for an hour until doubled in size. 12. 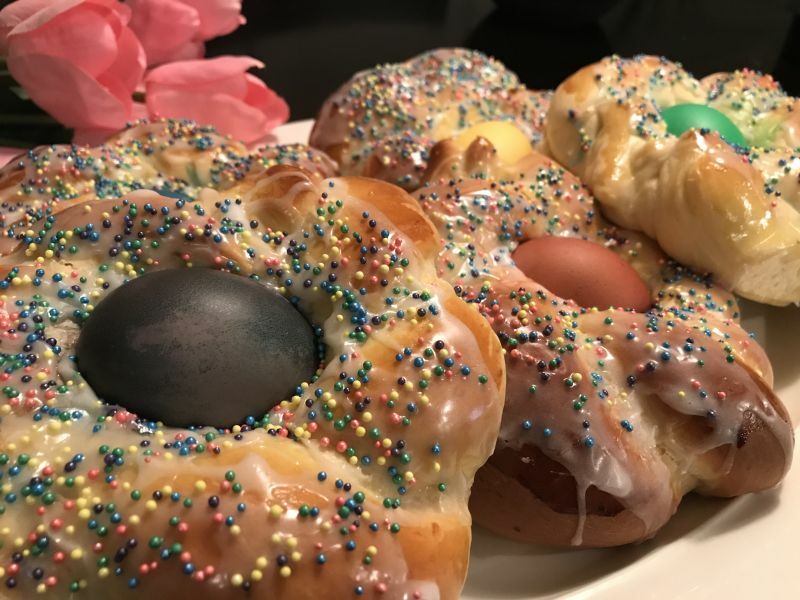 Gently brush each wreath with the egg wash, and place a colored egg in the center of the wreath. 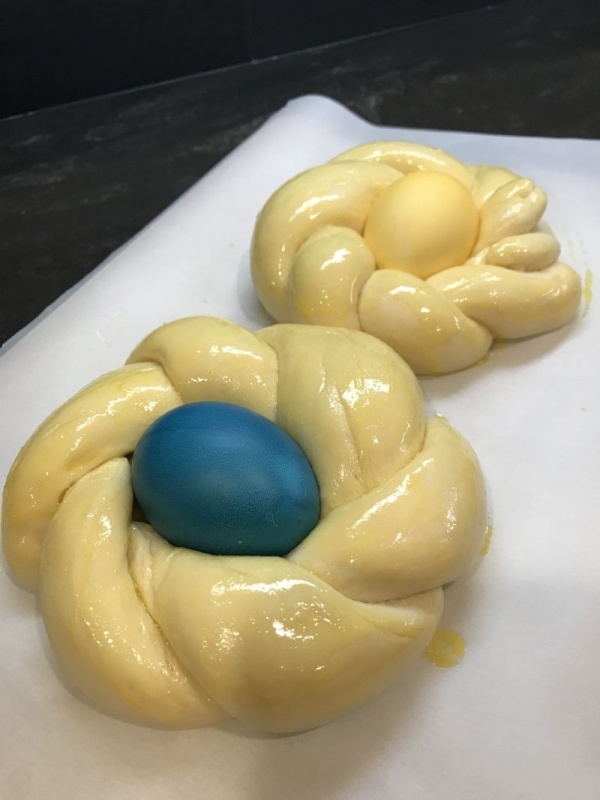 Gently press the egg in to the dough a little so it is secure. Allow them to rest another 10-15 minutes before putting them in the preheated oven. 13. Bake at 350F for about 20 minutes. 14. Mix the powdered sugar together with the milk and vanilla until smooth. 15. After the bread has cooled slightly, drizzle with glaze and sprinkle with the sprinkles! Amber comments: This week’s recipe was so perfect for a wine pairing. 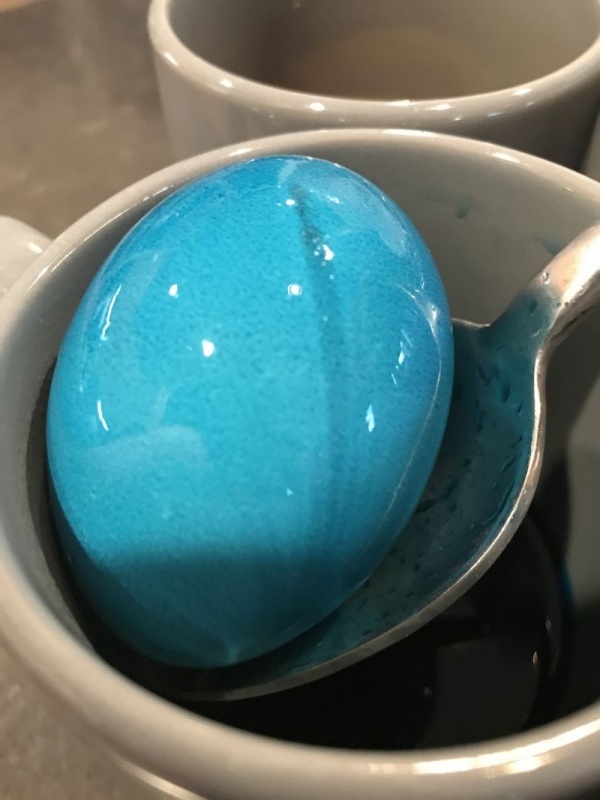 I thought the sweet and savory flavors would work absolutely perfectly with none other than some bubbles. This time, as it is spring I thought we would make the bubbles pink. 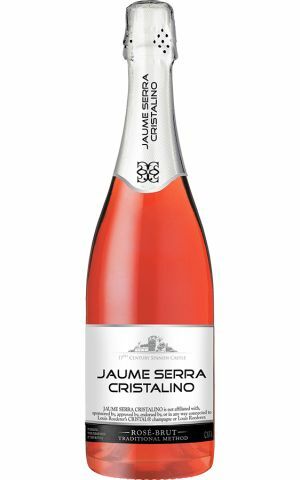 There are many pink sparkling wines out there, but one of my favorite bargain bottles is Jaume Serra Cristalino Rosé Brut. You can get in the grocery store for around $10 and it is a great all around sip. I took these to work to share, but not before my husband ate one hot out of the oven with the egg. 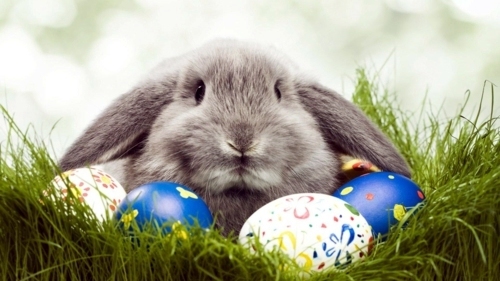 I hope you all have a wonderful Easter holiday! Looks delicious, but definitely not easy. Happy Easter. Easy as in anyone can do it… beginner level. Though yes, there are many steps. Thanks for your comment Michelle! Happy Easter! What a fun project to do with my niece and nephew! Probably won’t get to it by Easter, but maybe soon. Happy Easter! I love coloring Easter eggs! And they’re even better when you put them in the middle of beautiful breads 😍 so impressed! They turned out so pretty and I’m sure delicious! I love this recipe too. Its got that whole sweet and savory thing going on which I love. Thanks for commenting!